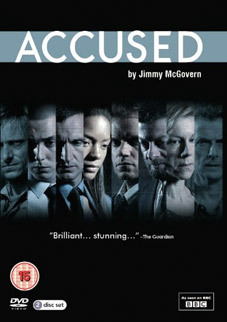 In 2010, award-winning writer Jimmy McGovern (Cracker, Hillsborough) delivered Accused, a heavyweight drama that tells a series of compelling tales of how ordinary people become the the accused of the title. It first screened on BBC1 to considerable critical acclaim and stars a veritable roll-call of British acting talent including Peter Capaldi, Andy Serkis, Christopher Eccleston, Mackenzie Crook, Warren Brown, Naomie Harris, Ben Smith, Juliet Stevenson and Marc Warren. Christopher Eccleston stars as a decent man in turmoil, Mackenzie Crook is Corporal Buckley in a story of two friends who join the army and discover not obeying orders can lead to deadly consequences. Juliet Stevenson and Peter Capaldi play parents whose son is fatally injured at work and Andy Serkis is a cab driver seeking to escape the drudgery of his life. Marc Warren stars as a father who acts against his better judgment and Naomie Harris and Warren Brown are a married couple whose fall out leads to foul play. These unflinching crime and punishment stories consist of gripping hypothetical situations, moral dilemmas and intriguing characters. Each scenario ends with someone in the dock, but should they be there? Are they innocent, guilty or somewhere in between? Described by The Telegraph as "A moving and powerful piece of television" and The Guardian as "Brilliant," Accused will be released on 2-disc DVD by Acorn Media Ltd on 27th August 2012 at the RRP of £19.99 to co-incide with the first TV screening of the second series. Special features will include an exclusive behind-the-scenes featurette with Jimmy McGovern.